Do you love earthly delights? You'll adore these! I embossed the trees onto antiqued brass blanks, polished the highlights and painted the backgrounds an earthy green. 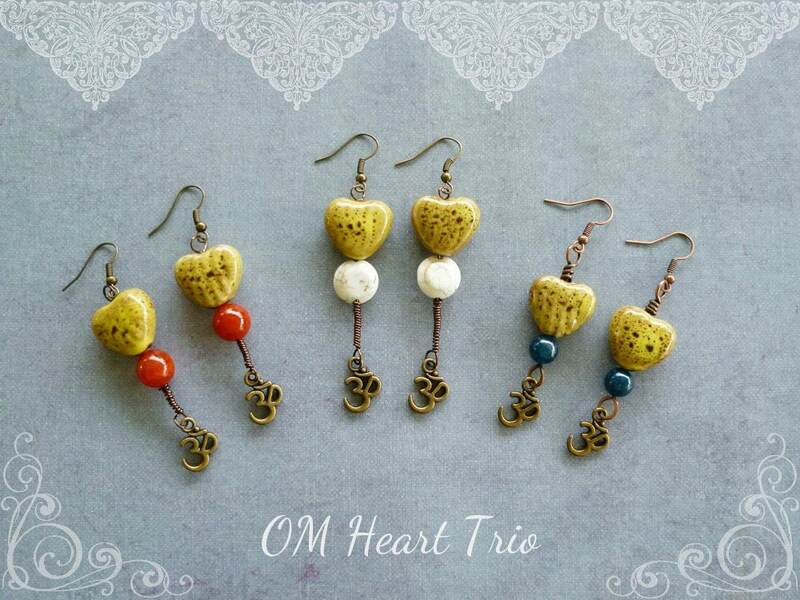 They dangle from ear wires I fashioned out of raw brass, and have a red-orange saturn bead and a little vintage brass bead shining above the tree tops! Click the image above to see if these are still available for purchase or to place a custom request. 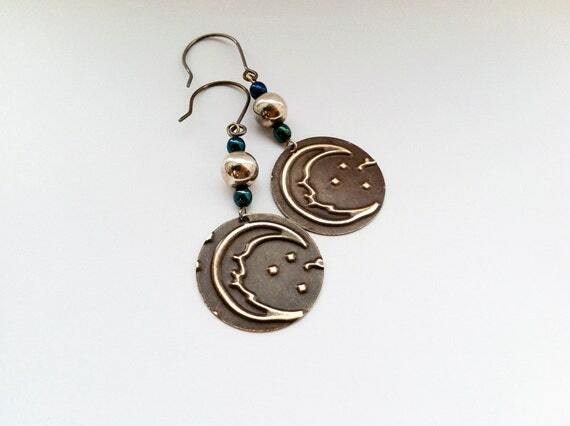 These earrings feature an embossed brass crescent moon and stars dangling below a silverplate bead and small blue glass beads. 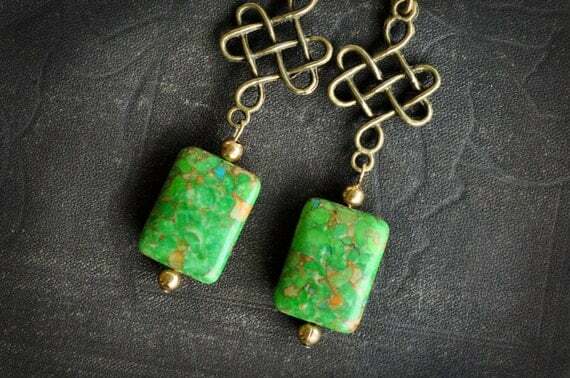 Elegant brass Chinese knots and green aqua terra jasper beads give these earrings an eastern flair. Aqua terra jasper is not a true jasper, it is a man-made product. That said, this particular green aqua terra jasper is quite lovely, and I haven't been able to find any more like it to replace my small supply. So if you like them, "get 'em while you can!" 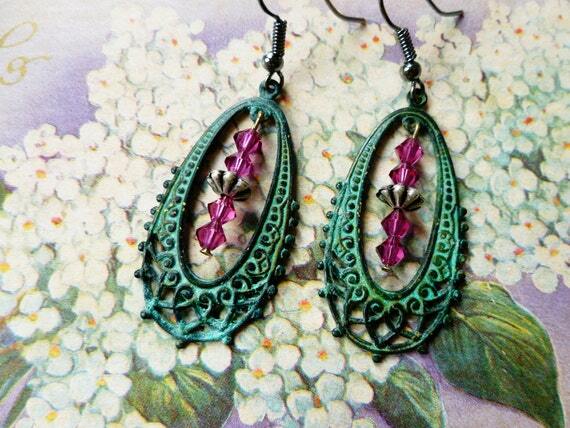 Sparkly Purple and Pink Earrings, Whimsical and Boho Chic! These are so lovely I made a pair for myself, and I love to wear them! They have a touch of boho glam that really suits me. 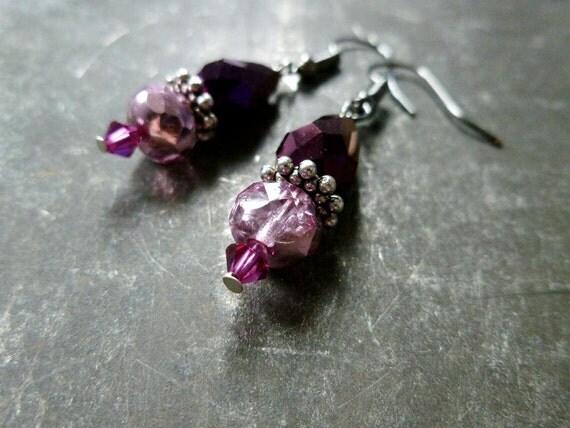 If you love purple and pink, things that sparkle, and earrings that are delicate yet make a strong statement, grab yourself a pair! 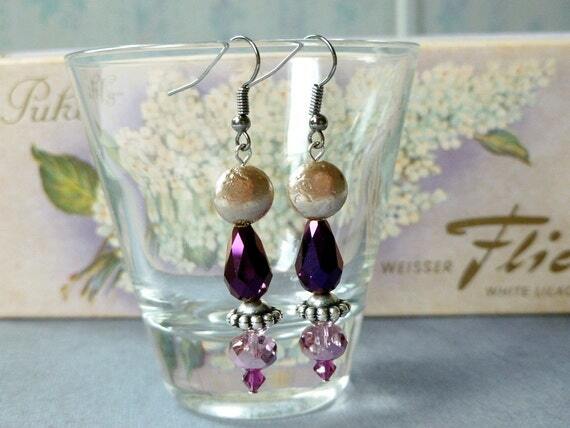 These glamorous dangle earrings feature a faceted purple glass briolette topped by a pearlized, texturized glass bead. A silverplate Saturn bead spacer sits below the briolette. Beneath it, a pink partially mirrored bead adds sparkle no matter which way it's turned, and the final touch is a small fuscia glass bicone bead adding balance and perfection! I love the color combination of the blue-green vertigris with the fuscia glass beads! The fuscia bicone beads are separated by silverplate beads for an extra touch of glam. 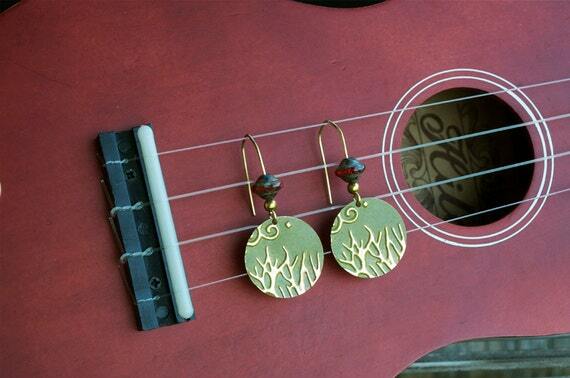 These earrings will charm onlookers as they dangle from your ears. They're delicate and yet they really pack a punch visually. 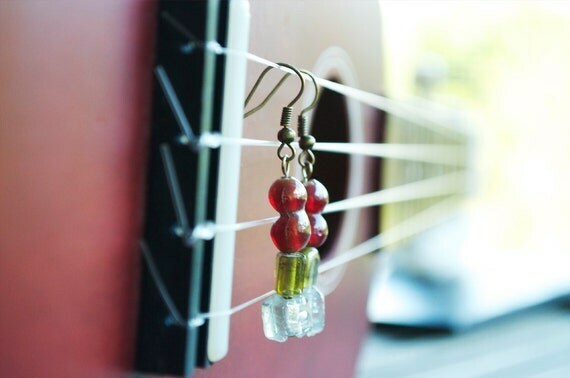 These chunky glass earrings feature irregular glass beads from India. They go with boho and gypsy attire, or something whimsical! Due to the irregularity of the beads, these earrings are one of a kind, though I will be happy to make something similar if these are sold or if you want other colors. 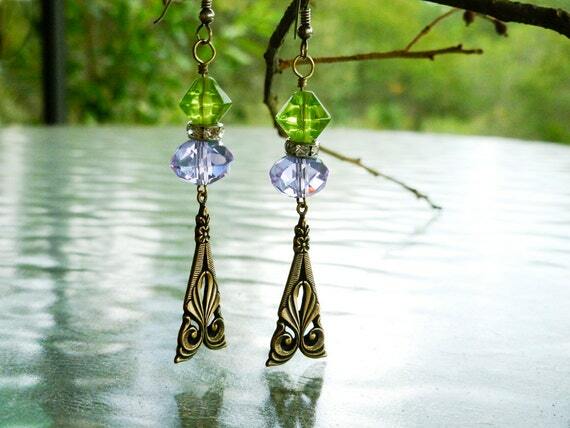 Dangle earrings with violet and green glass beads above a long triangle by Trinity Brass Co. These earrings are a bit casual, a bit fancy. There's even a bit of sparkle in the rhinestone spacer between the beads! Update: This trio is now available as a set. There is only one set available (until sold!) See it here. The red bead is carnelian, the white is white turquoise, and the blue is an unknown dark blue stone I got from a vintage bracelet. The mustard colored ceramic hearts are flecked with brown - very earthy! Wire wrapping adds a handmade touch. The red and white earrings are wrapped with dark brown craft wire; the blue are wrapped with oxidized raw copper wire. 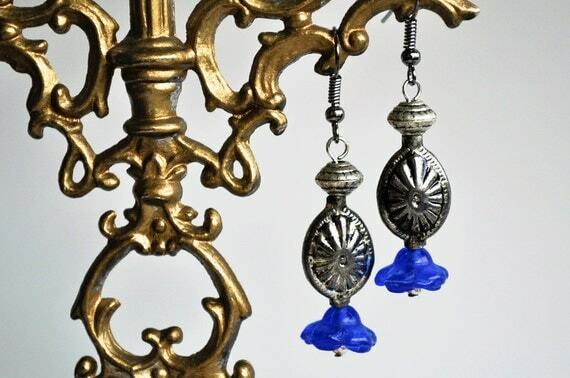 Vintage blue glass flowers hang below vintage silver finish beads. Only the bead wires and ear wires are new. I made these from vintage parts, so they're one of a kind - if you like them, make them yours today!